Yoko Acheson was born in Japan. She received her B. A. from Kobe College where she became a. part time instructor until she came to America. She received her M. M. from University of Nevada. After she moved to San Francisco, she taught piano at SF Community Music Center. After she moved to Sonoma, she served as a string and piano instructor at Napa College and Solano College and a member of Napa and Vallejo Symphony Orchestras. She was a member of a Middle Eastern Music band in SF and performed for belly dance shows for 16 years in Bay Area. Since there were no sheet music available she transcribed all the music for the band by listening to music. she has taken Suzuki Teacher Training from John Kendall at Claremont Graduate School at Pomona College before SAA begun their certificate system. She interpreted Dr. Suzuki’s lecture, “The Law of Ability” at Suzuki Conference, San Francisco State University and acted as a translator for Japanese tour group workshops, World Convention and ISA board meeting. she was a faculty at many Suzuki Summer Institutes and at the last World Suzuki Convention in Matsumoto, Japan. 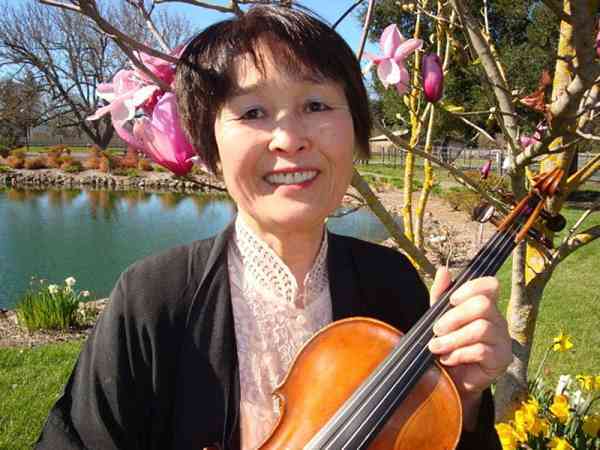 She was a faculty member at Dominican University Suzuki School of Music for 20 years and she established the string program at Marin Waldorf School and taught there for 4 years. Her book, “101 Japanese Children’s Songs” has been published by SAA . Her publications include theory books for violin, viola and cello, violin scale books and coloring review books. Her arrangements for strings are very popular. Contact Yoko by email to purchase her publications.